hellomagazine.com The reality star celebrated her third wedding anniversary by sharing behind-the-scenes photos from her wedding gown fitting. Three years of wedded bliss! Kim Kardashian and Kanye West celebrated their third wedding anniversary on Wednesday, 24 May. The 36-year-old reality star commemorated the occasion on her website by sharing behind-the-scenes photos from a wedding dress fitting leading up to her 2014 lavish nuptials. "Happy three-year anniversary babe! Thank you for being the best husband and father. I love you so much," Kim wrote. "I can't believe it's been three years!" The TV star shared an image of herself looking over fabric swatches with then-Givenchy designer Riccardo Tisci, who designed her wedding gown, in addition to a photo of herself taking a mirror selfie while wearing the Haute Couture creation. Another picture showed Kim snuggling her daughter North West, who was 11 months old at the time, while both of them tried on their wedding day attire. 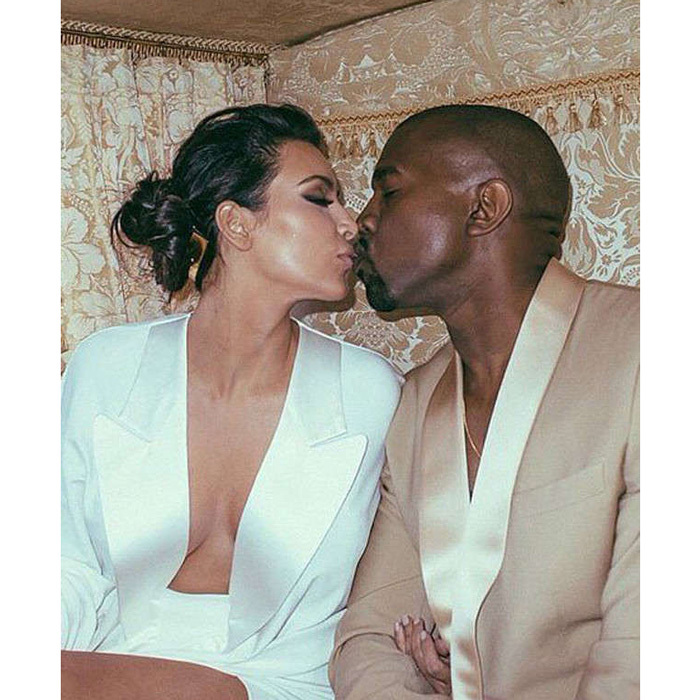 Aside from her wedding gown photos, the mum-of-two also posted a tender picture of her and Kanye kissing at a pre-wedding dinner held at the Palace of Versailles in France. The couple, who welcomed daughter North in 2013, and son Saint in 2015, exchanged vows at the Forte di Belvedere in Florence, Italy.